Aquatic therapy continues to grow in popularity as a safe complement or alternative to traditional land-based therapy that is suitable for children and adults of all ages and fitness levels. The soothing properties of water appeal to those in search of treatment that can heal the body while improving rehabilitation timeframes, fitness levels or reducing overall stress levels. Aquatic therapy is physical therapy that takes place in a pool or other aquatic environment under the supervision of a trained healthcare professional. Aquatic therapy is also known as water therapy, aquatic rehabilitation, aqua therapy, pool therapy, therapeutic aquatic exercise or hydrotherapy. Are you a professional looking for more information on aquatic therapy products? Are you looking for aquatic therapy near you? Aquatic therapy is different from aquatic exercise or aquatic fitness because it is a physical medicine and rehabilitation specialty that requires the involvement of a trained professional and is covered by many insurance providers due to the personalized nature of the treatment. Aquatic exercise does not need to be supervised by a trained professional. It is also not covered by insurance, and it often takes place in a group setting that includes multiple people with different levels of physical fitness. Aquatic therapy should not be confused with adaptive aquatics, either. Adaptive aquatics is the process of teaching people with disabilities how to swim safely in the water. Aquatic therapy does not focus on teaching clients how to swim. Water therapy services are generally offered in hospitals, sports medicine clinics and traditional outpatient rehabilitation centers. Senior living centers may also provide aquatic therapy services as a way to encourage their residents to maintain or improve fitness levels, balance and strength. Ancient Greeks and Romans bathed in hot springs to improve circulation and promote relaxation. Hippocrates recommended bathing in spring water as a way to treat sickness. Swiss monks were known to use thermal waters to treat sick or disabled people in their community. Japanese hot springs, or onsens, are said to have medicinal effects that include healing chronic pain, treating skin problems, curing menstrual disorders and relieving constipation. German physicians were firm believers in pediatric water therapy. Water birthing was very popular throughout Germany in the 1960s and 1970s. Warm water provides a relaxing and soothing environment for aching joints and muscles. Water’s natural viscosity or resistance can be used for muscle strengthening and increasing rehabilitation progressions. Buoyancy allows for flotation and reduces the effects of gravity on injured or aching joints and muscles. Hydrostatic pressure supports and stabilizes the client, allowing people with balance deficits to perform exercises without a fear of falling, decreasing pain and improving cardiovascular return. Turbulence and wave propagation let the therapist gently manipulate the client through the desired exercises. The respiratory muscles are forced to work harder in the water, allowing for a natural strengthening that benefits the client long after the therapy session has ended. To review the latest studies regarding the benefits of aquatic therapy, visit our Research page. People of all ages can enjoy water therapy benefits, including children with special needs and senior citizens. A trained therapist can create a session that takes into account any age-related physical limitations to promote a positive therapeutic experience. 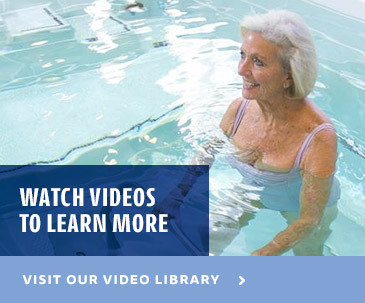 Our Video Library provides an extensive collection of case studies that illustrate the diverse applications of aquatic therapy. These videos illustrate the key role water therapy plays in promoting wellness. Even though aqua therapy typically takes place in a fairly shallow pool, it is not risk free. To provide a safe environment for clients, aquatic therapy practitioners should be trained in first aid, CPR, oxygen administration, automated external defibrillation, blood-borne pathogens and risk awareness (check local codes for actual requirements). Despite the many benefits of aqua therapy, some clients are hesitant to try this form of rehabilitation. For example, wearing a swimsuit in a public space can feel uncomfortable for clients.. Some clients may also physically struggle to dress properly for a therapy session. This requires the therapist to display compassion, empathy and understanding. There are many ways to address this self-image issue by offering alternatives such as shorts and a comfortable t-shirt for aquatic therapy, keeping dressing rooms and therapy pool separate from other therapy areas so that the session is semi-private and offering suits that are easier for those with arthritis or physical ailments. When working with a client suffering from a visual impairment, it’s recommended that the therapist orient that person to the pool before the session. The therapist should point out helpful landmarks, such as chairs and ladders, as they assist the client with walking around the perimeter of the therapy pool. Ai Chi is a form of water therapy that was created in 1993 by Jun Konno, and it combines elements of Tai chi chuan and qigong to relax and strengthen the body. Exercises use diaphragmatic breathing and active progressive resistance training while integrating mental, physical and spiritual energy. It’s a combination of both Eastern and Western beliefs. Clients generally practice Ai Chi while they are standing in shoulder-depth water. The initial focus is on mastering deep breathing patterns, with clients then progressing into gentle movement of the upper and lower extremities. Throughout the process, careful attention is paid to body alignment and breathing to induce a calm, meditative state of mind. It is hypothesized that Ai Chi can be useful in fall prevention programs for the elderly. Tai chi has long been used to improve balance in seniors, but Ai Chi provides an enhanced method of developing the lateral stability and stepping skills that play a crucial role in reducing fall risk. Also called deep-water running or aqua jogging, aqua running is a form of running in water that uses a flotation belt to support the head and upper body above water while preserving “normal” biomechanics. This type of aquatic therapy allows clients to experience the benefits of performing rehabilitation protocols without impact on joints. Aqua running in deep water or on an underwater treadmill is most commonly used to help speed the recovery of injured athletes or to improve the fitness of people who require a low-impact aerobic workout. For overweight or obese people who are physically unable to run on dry land, aqua jogging is a very effective weight loss technique. Since water is denser than air, aqua jogging burns more calories per minute than running on dry land. The pressure of the water also helps to allow the same intensity of exercise at a lower heart rate. Aside from its use as a therapeutic technique, aqua running has a history of being a popular competitive sport. The Aqua Jogging World Championships are held each year in Finland and attract a large number of skilled athletes. The Bad Ragaz Ring Method for aqua therapy was developed by a team of physiotherapists in Bad Ragaz, Switzerland. The goal was to develop a water-based strengthening and mobilizing resistive exercise model. Their work combines elements of aquatic exercise techniques developed in the 1930s by German physician Knupfer with the 1950s and 1960s research of American neurophysiologist Herman Kabat and his assistants Margaret Knott and Dorothy Voss. The “ring” portion of the name of this water therapy technique refers to the ring-shaped flotation devices used to support the client as they move across the water’s surface. During the session, the client is lying supine in waist- or shoulder-deep water. The Bad Ragaz Ring Method is commonly used with clients suffering from rheumatoid arthritis, soft tissue injuries, spinal injuries, head injuries and Parkinson’s disease. Fibromyalgia sufferers may also find relief from their chronic pain by incorporating this form of treatment into their overall plan of care. The Burdenko Method was created by a Soviet professor of sports medicine, Igor Burdenko. He designed this form of therapy as an integrated land and water approach. Dr. Igor Burdenko currently serves as the founder and President of the Burdenko Water and Sports Therapy Institute in Boston. His organization offers therapists an opportunity to be certified in this specific aquatic therapy technique. The Burdenko Method is often used for treating sports-related injuries. It works to improve a client’s speed, strength, flexibility, coordination, balance and endurance. Clients begin performing rehabilitative exercises in the water and progress to performing the exercises on land as their condition improves. Originally developed by fluid mechanics engineer James McMillan in the 1940s and 1950s, this aquatic therapy method focuses on helping clients develop balance and core stability. McMillan’s work with students at the Halliwick School for Girls with Disabilities in London helped teach swimming skills and general independence to physically disabled young people. Halliwick aquatic therapy is classified as a problem-solving approach. Therapists work to analyze the specific limitations and abilities of each client before developing interventions that will result in maximum functional increases. Watsu was developed in the early 1980s at Harbin Hot Springs, California by Harold Dull. In this form of aquatic therapy, the therapist supports the client through a series of flowing movements and stretches designed to induce deep relaxation as well as provide various therapeutic benefits. The movements combine elements of massage, shiatsu, dance, muscle stretching and joint mobilization. Waterdance: This form of hydrotherapy was developed by Arjana Brunschwiler and Aman Schroter in 1987. It uses massage, rolls, inversions, dance, somersaults and Aikido-like moves. Clients begin the session with above water stretches and then progress to exercising underwater with a nose plug. Healing Dance: Combining elements of Watsu and Waterdance, Healing Dance was developed by Alexander Georgeakopoulos with a focus on flow, rhythm and 3D movements above and under the water. Jahara Technique: This peaceful form of aquatic therapy was developed by Mario Jahara and incorporates flotation devices to provide continued traction while stressing spinal alignment, muscular release and gentle bodywork. Warm up: The client begins with low-resistance exercises designed to target the upper and lower extremities. This often includes stretches and extensions, followed by brief walking or jogging on an underwater treadmill. Fitness and strength training: After the warm-up, the client will often perform cardiovascular activities such as running, sprint intervals or multi-planar activities. Strength activities, including plyometrics, can also be performed. Core training: After fitness and strength training, the client does 20-30 minutes of squats, leg swings, arm swings, shoulder presses and other core-training exercises. Cool down: Using a therapy pool with a massage hose attached to resistance jets provides a deep tissue massage experience that works muscles to prevent lactic acid buildup. Running provides an excellent cardiovascular workout, but can lead to joint damage. However, with an underwater treadmill, it’s possible to enjoy all the benefits of running without the impact. 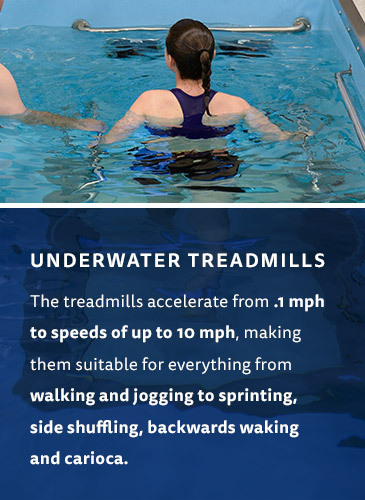 Underwater treadmills can be used to help athletes recover from injuries or to regain full-body motion after surgery. This is particularly useful if the athlete or patient is non or partial weight-bearing. High-end therapy pool models have resistance jets and adjustable speeds to allow for a gradual increase in workout intensity. HydroWorx treadmills feature rubberized belts for extra traction and can be used with either bare feet or shoes. The treadmills accelerate from .1 mph to speeds of up to 10 mph, making them suitable for everything from walking and jogging to sprinting, side shuffling, backwards waking and carioca. 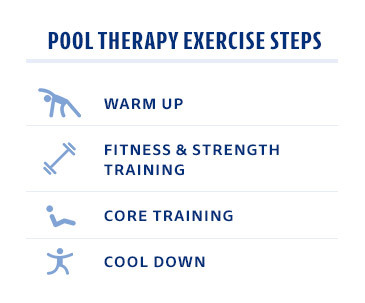 There are multiple types of aquatic therapy pools, ranging from small pools for single client use to large pools intended for group workouts. Therapists use cold-water plunge pools to speed muscle recovery in athletes and reduce joint inflammation. Hot-water plunge pools are used for relaxing muscles. The newest models of therapy pools offer pinpoint temperature control and special massage hoses to target the specific muscles in need of treatment. A pool with underwater massage capabilities helps prevent lactic acid buildup, which reduces soreness and speeds recovery time. Massage can also provide an effective way to help people dealing with chronic pain. Many therapy pools include stairs to promote safe accessibility for users with mobility issues. Therapists who frequently work with the elderly, small children or clients with serious injuries may utilize a pool with a moveable floor that makes it easier for clients to enter and exit the area. For example, the HydroWorx 2000 and 1200 Series pools feature a fully moveable floor that can be raised and lowered in less than 30 seconds to allow for a safe entry to the therapy session. Adjustable water depth controls, whether standard or as an optional therapy pool feature, benefit therapists by allowing for easy adjustments to pool water levels. This allows for a therapist to determine what percentage of the client’s weight should be supported, creating a session that is tailored to the individual’s abilities. Underwater cameras are key features in effective aqua therapy pools, as they allow for therapists to monitor the client’s form and progress from session to session or to make real-time adjustments. Clients can also use the cameras to provide an additional level of visual feedback as they work through a series of exercises. The type of aqua therapy exercises a client needs will depend upon their required rehabilitation, physical limitations as well as the specific method of treatment. For example, the Bad Ragaz Ring Method relies on having the use of flotation rings around the client’s neck, arms, pelvis and legs. For aqua jogging, a flotation belt is used to ensure the client remains in an upright position with their head above water. What Should a Client Provide? The water therapy client must have appropriate attire such as a swimsuit or comfortable clothing that can get wet. It is also recommended that clients provide a towel, cover-up, shoes to protect their feet in the pool area and a plastic bottle with drinking water to maintain hydration. Clients who need assistance dressing, showering or walking should have a caregiver present during their treatment sessions. If the client is a child, their parent may be asked to participate in the session. For more information about aquatic therapy pools and implementing aquatic therapy, or to request a demo, contact us today.